British sculptor Steven Whyte has a public study and gallery on Monterey, California's Cannery Row — the same neighborhood that inspired the work of author John Steinbeck. It's a suitable common ground since, like Steinbeck, Whyte finds his inspiration in the portrayal of everyday people, their flaws, quirks and emotions fully intact. "The human body tells an individual's life story," says Whyte. "You can see how the subject has worked and what they've lived through. I like having the ability to tell that story. Also, anatomy and the mechanics of the body provide a constant challenge for me. I believe that it's possible to combine realism and fine detail with emotional resonance and that the affective reproduction of the human figure achieves that balance. So, that's what I strive to do each time I begin work on a new piece." 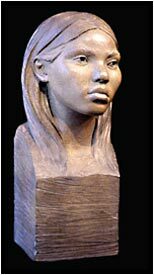 Whyte achieves this verisimilitude by going straight to the source; he's one of increasingly few figurative sculptors who use life models for all of his works. He occasionally even uses several different models to create different aspects of a single work. "The works are oftentimes not meant to suggest a specific person," he says. "Also, I never use professional models, only regular people. These two techniques give my work a foundation of realism and character. Further, the easy reference of life models allows me to show realistic motion in each piece. I try to have an element of movement in every pose, so that even if a figure is displayed at rest, there is a tension and energy to the piece." A further sense of depth is added by Whyte's background in portrait sculpture, which augments his ability to give his works real personalities. Much of this skill was honed at Great Britain's Sir Henry Doulton School of Sculpture. The school closed as Whyte was enjoying the first successes of his professional career. Concerned that the traditional approaches taught at Doulton would disappear "in the zealous embrace of abstraction and deconstruction," Whyte joined with fellow sculptor Michael Talbot to produce the first validated course devoted exclusively to figurative sculpture, and taught it at Stafford College. 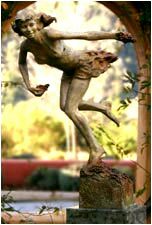 Now a resident of Carmel, California (home to Pebble Beach, Clint Eastwood and a longstanding artistic community), Whyte pursues a range of figurative ideas, including tributes to classical figures like Bacchus and Demeter, life studies of individual models, and portrayals of celebrities like baseball player Bobby Bonds (for the city of Riverside, California) and a series of designs he's currently undertaking for a tribute to Martin Luther King. In true democratic style, aficionados can vote for their favorite design at Whyte's website. As insistent as he is on the real-life details of his subjects, Whyte also involves himself in every stage of the bronze casting process in order to ensure that the final work is of the highest quality. "I know some sculptors leave the final production of their work to foundry workers or other artisans," he says, "and that some of the widely distributed sculptors have begun casting work overseas. I use only US foundries - no offshore casting. Casting to the highest quality means having the best copper, the purest material: U.S. copper."